Moray East Offshore Wind Farm will be located 22 kilometers off the Aberdeenshire coast in Scotland and will have an installed generation capacity of 950 megawatts after its completion. It is being developed by a joint venture company owned by EDP Renewable, ENGIE, and Diamond Generation Europe Ltd., a subsidiary of Mitsubishi Corporation. After commissioning Moray East will provide enough clean energy to power almost one million UK homes. Siemens will deliver the onshore substation and three offshore transformer modules (OTM®) which transform the output of the wind turbines from 66 kilovolts (kV) to the transmission voltage of 220 kV. Moray East marks the largest offshore grid connection in terms of transmission capacity and order entry Siemens has delivered or been awarded in the UK to date. As a world's first, three OTM® are linked together to cover the rated capacity of 950 MW. As an OTM® is significantly smaller in size and weight compared to conventional alternating current platforms, there's no need for special vessels for transport and installation. Thus, this innovation will save time and money. 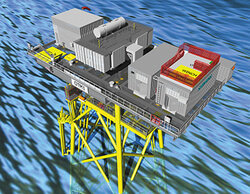 Siemens will be responsible for the complete onshore substation including three SVC Plus as well as the three offshore substation platform topsides. In addition, it will also install a 30 km underground export cable to the onshore substation at New Deer in Aberdeenshire for the power generated. Work began on site in September 2018 to prepare the location which will house the onshore substation. It is anticipated Moray East will be operational by April 2021. Mirko Düsel, CEO Transmission Solutions at Siemens Energy Management, said: "These platforms for large-scale renewable projects make me incredibly proud. Not only do they incorporate our engineering excellence on a massive scale, they showcase our commitment to renewables and clean energy generation. We are delighted our market-leading technology is being used on this project."